The library is currently in a stable release, suitable for download and incorporation into user projects for both host and device modes. For information about the project progression, check out my blog. LUFA is written specifically for the free AVR-GCC compiler, and uses several GCC-only extensions to make the library API more streamlined and robust. You can download AVR-GCC for free in a convenient windows package, from the the Atmel website. LUFA is being used all over the world, in many applications - both free and commercial. For an extensive list of known-LUFA powered projects and products, see the LUFA Powered Projects page of the library documentation. Want to Use LUFA Commercially? 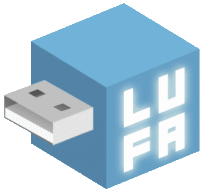 LUFA is free to use - even for commerical purposes, subject to the MIT license restrictions (see project documentation). Please see the license purchase page for more details. Hello all readers of the international Elektor magazine! LUFA is featured in the January 2010 issue, in the article My First AVR-USB - thanks to Elektor, it's now available online for free! The following links point to third-party ports of the LUFA codebase to other architectures than those targeted by the official release. I make no claims as to the quality and/or completeness of these non-official forks.